Screenshot: MediaPart. 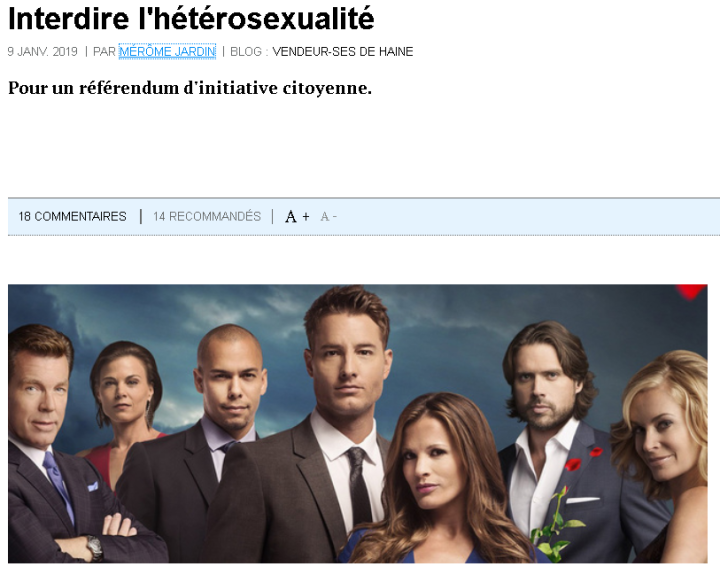 The top line translates to “Prohibit heterosexuality,” according to Google Translate. Excuse us, but given that human beings generally reproduce through some form of heterosexual mating, it seems that everyone, including the author of the original post, is a byproduct of heterosexuality. If heterosexuality, i.e., the interaction between men and women that has kept the species alive for thousands of years, is banned, how does the author expect to see another generation produced? Oddly enough, the author, Mérôme Jardin, says he was part of Act Up-Paris from 1998 to 2013 and is a current member of the Collective Against Islamophobia (CCIF). “…I don’t think this guy will last long after the Muslim takeover of France,” Diversity Macht Frei said in conclusion. Exit question: How long before Democrat Socialist Alexandria Ocasio-Cortez and her fellow social justice warriors glom on to this idea?